It’s pretty, but can it go supersonic? You are at:Home»Aviation»It’s pretty, but can it go supersonic? 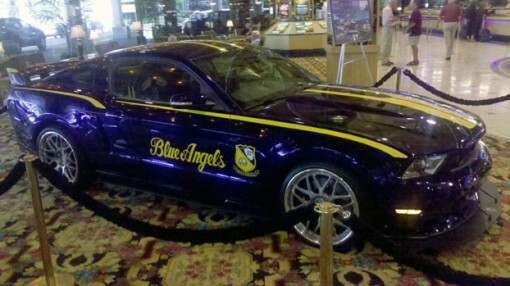 Parked in the lobby of John Ascuaga’s Nugget hotel and casino in Reno, Nev., is a one-of -a-kind Ford Mustang. Loaded with a 624-horsepower super-charged engine, the car has a custom paint job inspired by the Blue Angels, complete with a paint job of non-production, silver-infused blue paint. The Scoop Deck has seen pictures of the car before, but checking it out in person gives the change to peer over the velvet ropes and into the interior. It’s more stately than glitzy. The dash has clean lines, soft curves and is a good exercise in subtlety. Unfortunately the lighting in the lobby makes it tough to snap a good picture with a camera phone. The car was created in tribute to 100 years of naval aviation and was in Reno for the annual Tailhook Reunion and Symposium. Tailhook, the organization that single handedly ushered in the Navy’s era of political correctness…..Thanks guys.